Industrial Model with Printer is designed especially for Canteen Management systems. This device comes with thermal printer for printing coupons. The Industrial Model with printer comes in heavy metallic body for dusty and harsh environments. It has 62,500 records storage capacity with 9,560 fingerprint templates storage capacity. 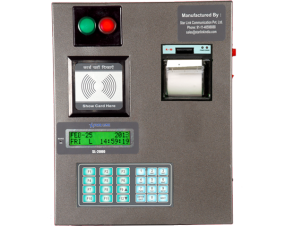 The Industrial Model with printer features LCD display to show the information of the employees whereas 2 large lights (Red & Green) indicates the status of the attendance. The built in TCP/IP connectivity helps to get the data with a single click of the mouse. It features heavy duty battery back-up of up to 48 hours, which makes it more compatible with the industrial environments. This device works on multiple operational modes.